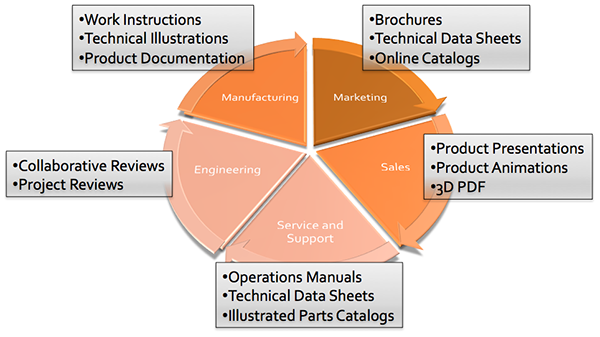 Create informative content from 3D CAD data, deliver it and involve the extended team! QuadriSpace products, cloud services and apps make it easy to create documents and content from 3D CAD files, distribute relevant content and collaborate with team members. The Pages3D and Publisher3D software makes it easy to create content from 3D CAD files that is ready to be distributed to others through print, 3D PDF or in the cloud. Share3D cloud-services enables the secure distribution of interactive 3D content to anyone, anywhere. Since Share3D leverages the cloud, it also empowers private collaboration between team members, vendors, suppliers using apps and email-in-the-loop features. Create content based on your 3D CAD data using Pages3D or Publisher3D. Distribute content as print, 3D PDF, or privately share content in the cloud with Share3D. Collaborate with Share3D's interactive 3D apps and email-in-the-loop features to involve everyone.